Every Good Friday, a pub not far from me tops London's list of Quirky Things To See At Easter. The pub is The Widow's Son in Bromley-by-Bow, and the reason for widespread interest is dangling buns. Legend has it that in the early 18th century a local sailor, having promised to return home at Easter, drowned at sea. His mother refused to accept the loss of her son and baked a hot cross bun for him, annually, until she died. 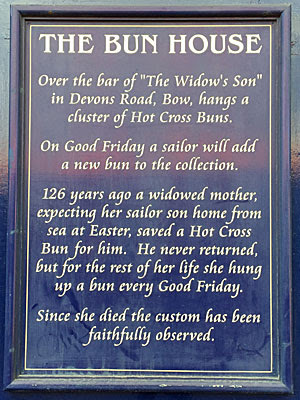 The Widow's Son pub opened on the site of her cottage in 1848, and the bun-baking tradition has continued ever since. A net full of increasingly stale buns hangs from a beam over the bar, and each Good Friday a serving sailor comes along to drop another inside. Or that's the story. What's more the bun-hanging part of it is true. A new bun has indeed been added every year, in a packed pub, under the watchful eye of the latest landlord or landlady. But this year the tradition looks likely to fall flat, for the first time in 168 years. And the reason, you'll not be surprised to hear, is housing-related. If you head down to the Widow's Son today, initially everything looks normal. The pub's bright white frontage faces a mini-roundabout close to Devons Road DLR. The name of the pub is written above the door in authentic gold lettering. A BT Sports banner hangs above the door, where a BT Sports Sticker also appears. The windows are clean and clear, and the alley up the side unobstructed. But look again. The bracket where the inn sign should be hanging is empty. The door is locked, even though it's prime drinking time. And, if you poke your nose up against the glass, the interior is stripped and empty. Not completely empty. The bar is still intact, with a row of gleaming handpumps on top. A row of red-cushioned chairs is lined up alongside, poised for punters wanting a pint of Carlsberg, John Smith's, Carling, Guinness, Stella or Strongbow, as applicable. But there are no bottles behind the bar, no optics filled with spirits, no sign of anything resembling economic activity. Instead a squirty bottle of cleaning fluid and a single toilet roll stand alone in front of the mirrors, hinting very much that the place is being given the once-over before being mothballed, or handed over to a new leaseholder, whatever. And most importantly, there are no buns. The Widow's Son was bought out by new owners, Dalco Developments, on 23rd March 2012. Landlady Erica Turner refused to sign a change of contract and vowed to fight plans to convert the upstairs floors into flats. "I have a ‘grandfather’ lease with four years left and am seeking legal advice to keep it," she told the local paper at the time. The problem seems to be that those four years are now up, and Erica's tenure is at an end. Indeed, if you poke around the internet a bit you can find the brochure for potential new tenants to take over. The unit comprises the ground floor and basement parts of a two storey grade II* listed pub with exposed brick elevations beneath a flat roof. 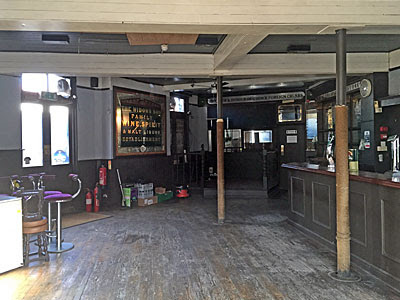 The pub will retain its traditional interior and frontage. It has an open plan ground floor trading area fitted with a single side servery, a set of ladies and gentlemen’s toilets are located to the rear. The basement has good floor to ceiling height and is in use as a cold beer store with ancillary storage areas. The unit is being offered by way of a new lease for the ground floor and basement parts of the building on a free of tie basis. The term will be for a minimum of 20 years subject to rent reviews to open market value every five years. The permitted use will be as a public house and premises. The successful applicant to take a new lease with effect from April 2016 or sooner. The property is currently open and trading and set to cease trading on or before 21st March 2016. Interested parties are encouraged to initially undertake a customer inspection and have reference to the attached plans which illustrate the current layout of the ground floor. Please do not engage with either staff or customers regarding the future new lease. From this I think we can assume there's no love lost between the former tenants and the property company, "a specialist, boutique operation offering the highest quality of service, advice and insight across the licensed leisure industry." I'm also highly intrigued by the timing. Trading at the Widow's Son was due to cease by Monday 21st March, indeed I can confirm the place was dead and lifeless the day before. But the new lease isn't due to take effect until April, which leaves the pub empty for a short but crucial gap which includes Good Friday. I can confirm, again, that as of Maundy Thursday afternoon the pub was very much not in operation, nor seemingly close to being so. Which begs the question, what's going to happen to the bun ceremony this year? There is another important aspect to the story, which is the redevelopment of the land surrounding the pub and immediately to the south. This part of Bromley-by-Bow is rapidly developing into a new residential hinterland, the Docklands Light Railway finally transforming the land along its length into densely-packed housing. The latest project is Merchants Walk, a high profile project with a marketing budget to match, comprising functional but architecturally undistinguished flats in a ubiquitous style I call 'brownblock'. 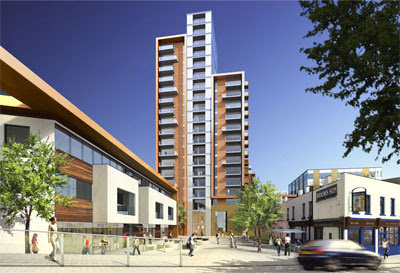 557 residential units are planned, in new buildings rising up to 20 storeys, across the former light industrial Bow Enterprise Park. According to the brochure, the future of the Widow's Son is as follows. 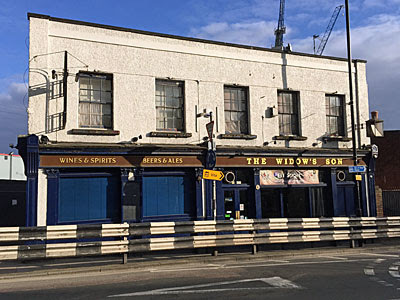 The neighbouring Grade II listed public house The Widow’s Son is undergoing renovation and will provide a place for refreshment and gatherings such as the traditional East End ritual, the celebration of the Widow's Buns. Notice it doesn't say pub, it merely says place for refreshment, which could mean gastrobar, cocktail joint or even coffee shop. I'm hopeful that a proper pub might reappear, but it'd be on new terms, and targeted more towards young thrusting types rather than anyone currently local. At least the intention is for the annual bun-hanging ritual to continue, perhaps not quite so rough and ready as before. But not this Good Friday, if the view through the window is anything to go by. Best hope that the widow's son doesn't pick Easter 2016 to finally return, and that this increasingly stale situation finally resolves itself. Update: The bun-hanging ceremony has moved to the Queen's Head in Limehouse, another threatened pub, from 2pm.